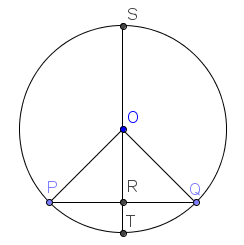 The perpendicular bisector of a chord of a circle passes through its center. In this post, we prove this claim. Let be the center of the circle. Draw , a chord and let be its midpoint. Construct perpendicular to latex R as shown above. We show that is on . The perpendicular bisector of a chord passes through the center of a circle. Since is the center of the given circle, because both of them are radii of the same circle. Also, since is the midpoint of . In addition, because a segment is congruent to itself. So, by the SSS Congruence Theorem, . Also, and both of them are right angles. Therefore, is a part of the two right triangles which means that it is on . This is what we want to prove.